1.1. The term Desi, very often, is used along with or in contrast to another term Marga. Both these terms -Marga and Desi- refer to traditional systems of Music of India. Marga or Margi or Gandharva is the ancient class of Music that precedes the time of Natyashastra (say, before second century BCE). Marga (the path or the tradition) signifies something that which is chaste and classical. And, Shiva himself is said to have taught this Marga Music, on his Veena, in his Sri Dakshinamurthy form, to the sages sitting around him. The early Marga songs were in praise of Shiva (Shiva-stuti). And, during the times of Natyashastra, Marga songs were traditionally sung for offering worship to gods, in the preliminaries (purvanga), that is, before the commencement of the play proper. Bharatha explains Marga or Gandharva as the Music dear to gods (atyartham iṣṭaṃ devānāṃ), giving great pleasure to Gandharvas; and, therefore it is called Gandharva. (atyartham iṣṭaṃ devānāṃ tathā prīti-karaṃ punaḥ | gandharvāṇāṃ ca yasmād dhi tasmād gāndharvam ucyate || (NS Ch. 28, 9). Marga Music was both sacred and well regulated (Niyata).And, by its very nature; Marga was rather somber and not quite flexible. 1.2. While Marga was the sacred Music devoted to please the gods by submitting gentle appeals, Desi was the art-Music that set out to hold a charming appeal to human beings. It was said; Desi is that which delights the hearts of humans (hrudaya-ranjaka), enchants common folks, cowherds, women, children and nobility alike; and, reflects the range of emotions and tunes springing from different regions. In other words, it was meant for ‘pleasing the hearts of the people’; its nature varied from Desha to Desha – region to region. It was basically the Music of the regions (Desha = region). Desi the music of the land was rooted in the music of the regions, capturing the unique flavors of the regions and sub-regions; and, giving expression to the moods, joys and sorrows of common people. The term Desi encompassed all forms of created songs (Gita); and even the art forms of instruments (vadya) and dance (Nŗtta). As compared to Margi, Desi was relatively free, less rigid and improvised music of the countryside. 1.3. But, it would not be correct to equate Desi with folk (jaana-pada) and tribal songs. Desi music was in strict conformity with the lakshana-s (theoretical principles) and the lakshya (practices in vogue) of the then established classical or well regulated (Niyata) Music of its times. Desi Music was perhaps more relaxed in its approach; and its form opted for a lesser regimen of the Grammar. Chatura Kallinatha (15th century) in his Kalanidhi, a commentary on Sangita-ratnakara, states that of the ten older types of Grama-Ragas, the Raganga, Bhashanga, Kriyanga and Upanga were regarded as Desi Ragas. He remarks that in these Desi Ragas though some liberty was taken, the rules of the Marga-Ragas were not totally disregarded. 1.4. Matanga also says that Desi is modeled after the Marga; and both allow scope for structured (Nibaddha) and un-structured (Anibaddha – like Aalapi) Music. He says, Ragas are classified according to the number of notes composing them; such as odava (pentatonic) using five notes; shadava (hextatonic) using six notes; and, sampurna (heptatonic) using all the seven notes.No classical melody (marga) can be composed from less than five notes. According to Matanga, no Marga or Desi Raga can be composed of four Svaras (notes) or less. He remarks: those with less than five Svaras are used by tribes such as Savara, Pulinda, Kambhoja, Vanga, Kirata, Valheeka, Andhra, Dravida and forest dwellers. The exception being a class of stage songs called dhruvas, which though regarded as classical melodies, are found to be composed of four notes. Obviously, Desi was conceived as a chaste classical music, well regulated but not too rigidly. It was the art-music of the land. It was different from the tribal or folk music of the rural mass. Sarangadeva did not also equate Desi with folk music or Loka or Jaanapada sangeet. 2.2. Marga was the classical phase of the ancient Indian music. It was basically a sacred class of music; and in theatre it was sung to offer prayers to gods during the purvanga the preliminaries before the commencement of the play per se. It was somber and also not flexible. Marga was the icon of the Higher tradition. Its songs were composed in chaste Sanskrit following the rules of Chhandas (metre) Vyakarana (Grammar). Its music was based in the Jaati-s (melodies) and in Shadja and Madhyama Grama-s (groups of melodies). 2.3. Desi was the art-music of the regions. It represented the flowering of the Prakrit (other than Sanskrit) phase that began to flourish by around 4th century. Songs of Desi Sangita were in Sanskrit as also in Prakrit and other vernacular languages. They were modeled upon incidental music of the early theatre. Desi music was free flowing, vigorous and attractive; appealing to ones heart (hrdaya-ranjaka); as also providing scope for improvisation. Its melodic portfolio could be expanded to include all other types of melodies and Ragas. 2.4. One could say that the distinction of the two – Marga and Desi- is largely historical. The transmission from Marga to Desi was a progression from a regimented few towards a spectrum of wide choices. With the growth in art and art forms many styles of music sprang up in diverse regional traditions. The ways of musical expressions also diversified and grew in abundance. For instance; eighteen Jaati-s, two Grama-s and seven Grama Ragas expanded into more than 250 Ragas by the medieval times. Alongside, the varieties of rhythmic patterns, time-units and the entire system of Taala also grew very appreciably. Thus, the advent of Desi and its rapid development greatly enlarged the boundaries of ancient musical structure; opened up new horizons; and, altered and brightened the future course of Indian Music. 2.5. The classification of the Music of India into two strata – Marga Samgita and Desi Sangita – dates back to at least to the eighth or to the ninth century, mainly through the treatise Brhad-Desi by Matanga. 3.1. Before we get back to Matanga, let’s digress for a short while, and talk about classical and folk music. (i). In all literal art forms, two conventions (dharmi) or two streams of expressions are recognized; one is the Loka-dharmi and the other is the Kavya-dharmi. Similar conventions or forms exist in, music, dance or art. Loka-dharmi in poetry stands for a localized or an individual’s expressions of her/his experience or emotions. Kavya–dharmi is when an individual’s emotions are turned into a song or into a poem; and it is enjoyed by all as a beautiful piece of poetry. Here, an individual’s intimate emotions are shared by all as a work of art, independent of the poet’s localized circumstances that caused the poem. The poem that is enjoyed by its listeners/readers is far removed from its original Desha (location), Kaala (circumstances) and Karana (the cause that triggered the emotion). The emotional content (let’s say, love) in the poem is no longer limited to poet’s or to one particular person’s experience , but is generalized and shared by all as the idiom of expression of the entire gamut of that emotion (love). In the present context, perhaps, one could (roughly) equate the folk music with Loka-dharmi and the Classical music with Kavya–dharmi. (ii). The folk music is essentially the outpouring of the elementary, subjective human emotions. It generally is about purely personal emotions limited to an individual. It is spontaneous; and its purpose is to fulfill an immediate need to give forth to an emotional experience that is tied to a specific incident in one’s life or to an occasion, time, and place. In other words, folk music is immediately relevant for the emotions of only a small group, a community with a shared background and emotional state. Folk music is spontaneous and does not require training in a developed musical system. Folk music is certainly significant and pleasing; and is a powerful emotive language of a people. It is the medium through which shared feelings are communicated and experienced by the community. But, it is the innocent expression of basic, natural feelings, limited to the context of a particular time and situation. And, it is rather undeveloped or underdeveloped; is without structure, grammar or classifications; and does not require training in creating a song-form. In comparison; Classical music is not the simple expression and an instant gratification of a basic human emotion. It is a highly developed and complex art form ; and its creation is involved not merely with musical genius of the composer , but also with the intellectual processes and sensitivities that determine the quality of the creation in terms of musical contents of melody , rhythm; the structure and the Grammar of the composition; and its appeal. Here, the personal impressions or feeling of the composer are sublimated into a classical form that goes beyond subjective self. The composer’s or the performer’s individual identity is left behind. The created music is universal and is for all, instead of being limited to a specific individual’s personal feelings or to an occasion. Thus, both the folk and the classical are genuinely powerful and qualitatively rich in aesthetic value. They both aim to interact with human minds and hearts, each in its own way. One is elementary, subjective and localized; and, the other is developed, objective with its own sensitivities and is almost universal. The difference appears to be in the purpose of their creation, which defines their context and relation with the rest of mankind. 4.1. Matanga or Matanga Muni or Matanga-Bharatha (as he is regarded one among the five-Pancha Bharathas: Nandikesvara, Kohla, Dattila, Bharatha and Matanga) takes a very important position between Bharatha (Ca.2nd century BCE) and Sarangadeva (Ca.13th century). It is surmised that he perhaps lived during sixth or the seventh century. 4.2. Matanga’s fame rests mainly on his outstanding treatise Brhaddeshi. It carries forward the tradition of Natyashastra and Dattilam; and at the same time it establishes the Desi Sangita on a firm pedestal. Brhaddeshi bridges the Marga and the Desi class of Music; and also provides the basis for the emergence of the Mela system of classifying the Ragas. One could say, Brhaddeshi gave a new birth to Indian Music; and, revitalized its creative genius by bringing the concept of Raga into the very heart of the Music traditions and their sensibilities. Brhaddeshi also serves as a reference to many earlier authors whose works are now lost, such as: Kashyapa, Kohala, Durgasakti, Maheshwara, Yastika, Vallabha, Vishvavasu and Shardula. 4.3. The edition of Brhaddeshi, as it has come down to us, is an incomplete text. Only about five hundred of its verses are available. Those available verses and chapters deal only with Music; and conclude with the remark that the next Chapter will deal with Musical instruments (Vadya). Sadly, that and subsequent Chapters, if any, are not available. However, some commentators of the later periods cite from Brhaddeshi the references pertaining to instruments, taala and dance. 5.1. In the available chapters, the first portion starts with the definition of Desi. The term Desi, here, refers to all forms created of songs; and, it comprehends the three arts of Gita (song), Vadya (instruments) and Nŗtta (dance). One of Matanga’s major contributions is his scholarly focus on the regional element in music. Brhaddeshi (Brihat + Desi) is thus a masterly compilation of the music traditions of the various regions (Desha). 5.2. Next, the concept of Nada is described as the most subtle vibration which is the basis for speech, music, dance and all other forms of activities. Then, the text goes on to discuss two Grama-s: Shadja-grama and Madhyama-grama. From these, Grama-s the music elements Sruti, Svara, Murchana, Tana, Jaati and Raga are derived. 5.3. Matanga deals with Grama, Murchana and Jaati, rather briefly. According to Matanga, twenty-one Murchana-s evolved from the three main Grama-s: Shadja, Madhyma and Gandharva. Murchana were of two kinds: one, having seven Svaras and the other having twelve Svaras (sa-Murcchana dvi-vidha; sapta-svara-Murchanat dvadasha-svara-Murchana cheti). The Murchana with Seven Svaras was divided into four parts: Purna, Shadava, Audava, and Sadharana, The Purna contained seven Svaras (hexatone) ; Shadava , six Svaras (heptatone) ; Audava , five Svaras (pentatonic) ; and the Sadharana , two displaced (vikrita} Svaras : antara-gandhara and kakali-nishada. And, the Murchana with Twelve Svaras manifest in three registers (Sthana): low, medium and high (Mandra, Madhya and Tara). 5.4. The text then discusses Sruti (silent intervals between Svaras), Svara intervals in the two Grama-s and other terms and concepts such as, Tana, Varna, Alamkara, Jaati, Gita and Raga. Various other aspects including the popular melodies of his time are given in the other chapters. As the name suggests, it is a huge work and is highly informative. 5.5. He says that the Aroha (ascending) and the Avaroha (descending) pattern of Svaras form the Murcchana of a Raga. Murcchana, in effect, describes the string of notes that, with further embellishments (Alamkaras) of thirty-three varieties, constitutes the core of a Raga. These Alamkaras are indeed the musical excellences that adorn the songs. 5.6. After allotting a chapter to the Jaati-s, Matanga devotes a special chapter to the Ragas. Here, he deals with Grama-raga; and the Desi-ragas: Bhasa, Vibhasa and Antarabhasa. These Desi-ragas are again classified into four categories, Raganga, Bhashanga, Kriyanga and Upanga. 5.7. Indeed, it is in this chapter of the Brhaddeshi we first come across the definition of Raga as given by Matanga, and as understood by all later literature on Classical Music. In the history of the Ragas, Brhaddeshi is, therefore, a landmark text. 8.1. The term Raga conveys many shades of meanings ranging from color, hue, tint, dye, love, desire, passion, emotional attachment (as opposed to it is Viraga– detachment) , beauty, melody and so on . But, in the context of music it had a special connotation; and, it had been in use many centuries, even prior to Matanga. Bharatha in his Natyashastra used the term Raga in compound terms in association with Jaati raga, Grama raga. And, he perhaps meant ‘Raga’ in the general sense to suggest color or aesthetic appeal or enjoyment or pleasure. He employed the term Jaati to indicate melodies, but also used the term Grama Raga. But, somehow, he did not explain the terms Jaati and Grama-raga and their mutual relationship. 8.2. There was also the Murchana which was described in Natyashastra as the string of seven Svaras used in an order (krama) in their fixed positions. Later, in the Gandharva, Murchana came to be understood as an arrangement having a gradual Aroha (ascent) and Avaroha (descent) of the seven Svaras (notes). Different musical expressions were derived from the Murchanas by permuting the seven Svaras in any number of ways. These seven seem to correspond to the Grama-ragas in the Naradiya-shiksa the text said to belong first or second century BCE. 8.4. The term Raga seemed to have been in use even prior to 7th century. For instance; Poet Kalidasa (5th century) had suggested Raga Saranga (Madhyamadi) for rendering the introductory song to the first Act of his play Abhijnana Shakuntalam. And, in a fable appearing in the fifth volume of Panchatantra (5th century or earlier), a donkey poses as a musician and explains Gramas, Ragas etc. 8.5. Following the steps of Bharatha, Matanga also recognized Shadja-grama and Madhyama-grama as two basic Grama-s (groups or clusters). From these Grama-s he derived Sruti, Svara, Murchana, Tana, Jaati and Raga. The Aroha (ascending) and Avaroha (descending) pattern of Svaras, according to Matanga, formed Murchana of a Raga. [It needs to be mentioned here that Bharatha’s concepts of Jaati, Murchana and Giti continued to be in use even during the time of Matanga. He uses these terms and offers his explanations with illustrations from Natyashastra. Matanga regards Ragas as one of the seven classes of songs (gitis, melodies) current in his time: (1) Shuddha; (2) Bhinnaka; (3) Gaudika; (4) Raga-giti; (5) Sadharani; (6) Bhasha-giti; and, (7) Vibhasha—gitis. Of the seven classes of gitis, it is said; the Shuddha and the Bhinnaka have each five varieties; Gauda has three varieties; Ragas are of eight varieties; Sadharani is of seven varieties; Bhasha is of sixteen kinds; and, Vibhasha as of twelve kinds. Here then we have the first enumeration of eight of the earliest ragas known by name. Some of them may have been derived from the 18 jatis described by Bharata. There is a remarkable text which the scholars have neither been able to date nor understand it fully. It is titled Gitalamkara; and, is said to have been written by an author who, for some reason, called himself Bharatha. The book aimed at controlling or disseminating the arguments of the rivals (Vadi-mattagaja-ankusha) . In its Chapter 14, the book cites thirty-six ‘Ragas’ (which are named here as Varna or colors).They are classified into three groups: Purusha (male); Stri (female) and Apatya (descendents). This, by a long stretch of time, foreshadows the Raga-Ragini-Purta concept that came about in later times. 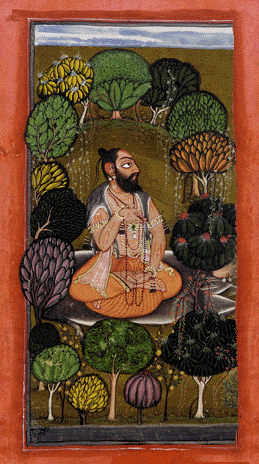 The scholars suggest that Varna might have been the older name of Raga (which also suggests color). The Gitalamkara treats the three ancient Gramas (Nandyavarta, Jimuta and Subhadra) in an un-usual manner. Instead of treating them as basic scales, as others did, it merely lists characteristic series of four Svaras (tetrachord) for each of them. This perhaps goes back to the period before the three Gramas: Shadja, Madhyama and Gandhara Gramas came to be recognized. 9.1. Yes; it seems the word Raga with its multiple meanings was in use even from early times. But, it was not used in Music or in Music-theories in the way we know it and use it now. It is, therefore, difficult to say Raga as it is understood today, had fully evolved and was recognized as such at the time of Natyashastra. 9.2. Which is to say; the notion of melodies that are created by artistic and ingenious arrangement of ascending and descending Svaras had been there for a very long time. It was a rather amorphous concept; its structure had not been determined; and, was waiting to be defined in a clear language. That is, precisely, what Matanga did. 10.1. The chapter titled Raga-lakshanam (characteristics of Raga) in the Brhaddeshi commences with two questions and a request: ‘What is meant by the word Raga? And, what are the lakshana-s of a Raga? You must please explain the origin and nature of Raga clearly ’. The nature of the Raga system (Raga-margasya- lit. path) has not been explained by Bharatha and others (Bharathadi); and, it is going to be explained (Nirupayate) by us, according to theory (lakshana) and also practice (lakshya) – (279). 10.2. Then he goes on to explain: A Raga is called by the learned, as that kind of sound composition (dhwani-bhedaya), which is adorned with musical notes (Svara), in some peculiarly (visesena) , stationary (sthayi) , or ascending (aroha), or descending, (avaroha) or moving values (varna), which are capable of affecting the mind with peculiar feelings or of colouring ( Ranjyate ) the hearts of men. A Raga is that which delights: Ranjana-jjayate ragau..
10.3. Or (Athava), it is that particular sound (dhwani vishesa) which is adorned by Svara and Varna (svara varna vibhushitaham); and that which delights the minds of the people (Ranjako jana-chittanam) is called Raga by the wise. 10.4. After defining Raga, in two way: as that particular arrangement or ornamentation of Svara and movement of Varna (Svara-Varna vishesha ; vibhushitam); and as the distinction of melodic sounds (Dhwani-bhedana) which delight the minds of people (Ranjako jana-chittanam) , Matanga takes up the etymological explanation of the term Raga and its origin (Utpatthi). Matanga says: this is how the word Raga is derived (Ithevam raga-shabdasya utpatthir abhidiyate). He explains that the word Asvakarna when it is derived from its root might literally mean the ears of a horse. But, in practice (rudi), Asvakarna is generally understood as the tree whose leaves resemble in shape the ears of a horse. Similarly, the word Pankaja literally means one that is born (ja) out of mud (panka). But, Pankaja in convention and common usage refers only to the lotus-flower. In a like manner, he says, the word Raga has etymological as well as special conventional meaning like the word Pankaja. He explains: whatever might be its other meanings, the word Raga (derived from the root ranj = to please), effectively suggests, here, as that which generates delight: Ranjana-jjayate ragau. [ Among the many tools (Nyaya) employed in the olden days to extract and to explain the meaning of the words and terms ,the Samabhirudha Nyaya derived the meaning of a word from its root; and , Vyavaharika Nyaya interpreted the word through conventions (rudi) and its common usage (paddathi) in day-to-day life (Vyavahara). The words Asvakarna and Pankaja are common illustrations of these Nyayas. And, Matanga’s argument is based on similar lines. There are many other similar words, such as: Mantapa which normally is understood as an open-hall; but, its etymological meaning could be ‘one who drinks scum of boiled rice (Ganji)’. And, the term Kushala is generally used to denote an expert or a highly skilled person (pravina); but, its etymology analysis would lead to one who is ‘good at cutting grass (kush). And, similarly, Ashva-gandha is literally ‘smell of the horse; but in common usage it refers to a medicinal herb. 10.5. Thus, the term Raga, in its etymological and technical sense, means a particular combination or sequence of Svaras and Varnas which delights, charms or colors (in broader sense ) the mind. Therefore, every Raga, while it delights also creates an emotional mood which colors or influences the mind in its own unique manner. It colors different minds in different ways. That is why a single Raga can yield divergent expressions, associations and experiences. 11.1. Along with defining Raga and explaining its concept, Matanga takes up the question of its identity. He says that the identity of Raga is conceived in two ways (dvivida matham): through its general (Samanya) classification and through its special characteristics (vishesha lakshana). He mentions the general categories as four (Chatur vidha tu samanya); and, that the Raga’s special identity lies in Amsa and other features (vishesha cha Amshakadhikam). As regards the four broad categories (Chatur vidha tu samanya) that Matanga mentioned, some say, he, perhaps, was referring to Desi ragas that are classified into four categories, Raganga, Bhashanga, Kriyanga and Upanga. These ragas are the basis for all musical forms presented in the later Samgita traditions and forms. 11.3. Amsa was said, during the time of Matanga, to be the prominent or predominant Svara through which the Raga manifested (raga-janakatvad vyapakatvaccha Amsasya pradhanyam). During his time, the term Amsa and Vadi were used alternatively. Kallinatha in his commentary has said that both Amsa and Vadi used to convey the idea of creating the pleasing sensations of the Ragas (Sa vadi tyogyatavashdt amsha syat rakti-vyanjakatvat). Along with Amsa, nine other characteristics (Dasha-lakshanam) of Jaati (melodies) were listed in Natyashastra (28.74) as also in Dattilam (55) as Graha, Amsa, Tara, Mandra, Sadava, Audavita, Aplatva, Bahutva, Apa-Nyasa and Nyasa. : – Audavita -Five note are used dropping two. : – and, Nyasa – It is the note with which the song ends. 12.1. In the explanations offered by Matanga, he mentions Svara, Varna and Alamkara etc. 12.2. The Svara, here, indicates the arrangement of five or more ascending and descending notes. According to Matanga, Svara is the sound which has musical quality that creates melody. When the interval between the notes (Sruti) is raised or lowered, the musical quality gets altered. Depending on their level of importance in a Raga, Svaras are classified under the four categories Vadi, Anuvadi, Samvadi and Vivadi (sonant, assonant , consonant and dissonant). Bharatha defines these in his Natyashastra. here , the Vadi is the most important Svara to a Raga. It is repeated often and used as a fundamental note upon which the raga sculpture is erected. Sa, shuddha ri, antara ga or pa are examples of Vadi Svaras. When sung with the Vadi Svaras, only certain Svaras have a pleasant or concordant effect. These are Samvadi Svaras, and they generally have nine or thirteen shruti intervals between them and their corresponding Vadi Svara . The Anuvadi Svaras help in adding substance to a Raga, and they are not emphasized. Vivadi Svaras are those which are discordant and create a displeasing effect when rendered with the Vadi Svara. The space between these two is usually one Svara, though it is often more than two Sruthi differences. 12.3. And, Varna refers to special note sequences that indicate different kinds of movement. The function of Varna in a Raga is to manifest a song; and, it is, therefore, known as gana-kriya. The Varna-s are said to be of four kinds, depending on the movement of Svara. They indicate the general direction of the melodic line. When a note remains more or less at the same level it is called Sthayi-varna (stable); when the notes are ascending or descending these are known as Arohi and Avarohi. And, a mixture of the three is sanchari-varna, wandering, back-and-forth. Shashina rahiteva nisha, Vijaleva nadee lata, Vipushpeva avibhooshitheva cha kantha, geethir-alamkara-viheena syath. The Alamkaras are associated with Varna (appearance, color, word, and syllable). It is said; if Varna is the architecture or the structure, then the Alamkara is its decoration bringing out and enhancing its natural beauty. In Music,the term Alamkara represents the combinations of progressions and ornamentation. The harmonious blending of structure and decoration is basic to all forms of Indian art. And, in early Music, probably, no precise distinction was made between Varna and Alamkara. Sthayi -Varna –Alamkara; Arohi-Varna-Alamkara; Avarohi-Varna-Alamkara; and, Sanchari-Varna –Alamkara. 12.5. Under these categories, Natyashastra had earlier listed thirty-three types of Alamkaras. But, Dattila later abridged the list to thirteen. Matanga who followed Natyashastra reckoned thirty-three Alamkaras. However, in later times the list grew up to eighty-eight types of Alamkaras. 13.1. Karnataka Samgita has developed an intricate system of Alamkara with subtle variations. It is celebrated as Gamaka. And, Gamaka, as such, was not mentioned in Natyashastra. But, the text does talk about different types of Alamkaras as that which add beauty and aesthetic value to Music. 13.2. Matanga, in his Brhaddeshi, however, does mention Gamaka. For in instance; while discussing about Raga-giti , one of the seven charming song-forms, he mentions that Raga-giti should be rendered with varied delicate Gamakas (lalithau–Gamakau-vichitrau); and should be adorned with Svara pronunciations, lucid, powerful and even (300); and the Vibhasha–giti should be sung blending in the Gamakas that are pleasant on the ears (Gamakau–srotra-sukhadai-lalithairasthu) and are also delicate , according to the will of the singer (yadrucchaya samyojya) to the delight of the people (lokan-ranjathe)- (308). 13.3. Sarangadeva in Chapter three: Prakīrņaka-adhyāya of his Sangita-ratnakara treats Gamaka in greater detail. He lists fifteen types of Gamakas (Panchadasha Gamaka): the kinds of shake or oscillations that Svaras can be endowed with. Tripa; Spurita; Kampita; Lina; Andolita; Vali; Tribhinna; Kurula; Ahata; Ullasita; Plavita; Gumpita; Mudrita; Namita; and, Misrita. Sarangadeva’s descriptions are closer to our understanding of Gamaka. Tripa: Playing one of the notes of a phrase with some stress. Spurita: wherein the lower note is faintly heard and the second note is stressed. Kampita: A slight tremble oscillating between two Svaras. Lina: Merging of a note softly into another note. Andolita: A free swinging. Holding on a note for some time and then pulling the string or gliding on it so as to reveal a higher note. Vali: deflecting the string in a circling manner for producing the chhaya of two or three notes from the same Svara-sthāna. Tribhinna: Produced by placing the left-hand fingers on a Svara-sthāna so that the fingers are in contact with three strings, and then by plucking the three strings with the right hand fingers either simultaneously or successively (only in fretted instruments). Ahata: Sounding a note and then producing another note without a separate stroke (only in Veena). Ullasita: Glide. Starting on a note and reaching a different (higher or lower) note by gliding over the intermediate notes. Plavita: This is a variety of Kampita. Gumpita: The tone is slender at the start and goes on increasing in both volume and pitch- in vocal music. Mudrita: Produced by closing the mouth and singing – in vocal Music. Namita: Singing in a slender tone –vocal Music. Misrita: Mixture of two or three of the other varieties. 14.1. In today’s Karnataka Samgita, Gamakas are essential aspects of Manodharma Sangita. Gamaka is much more than an ornament to Karnataka Sangita. It is a very essential constituent of its musical element and its elaboration. 4.2. Gamaka is any graceful turn, curve or cornering touch given to a single note or a group of notes, which adds emphasis to each Raga’s unique character. Gamaka, in short, is the movement of Svaras which bounce, slide, glide, shivers, rapidly oscillates or skips. It provides movement and animates Svaras to bring out the melodic character and expression (bhava) of a Raga. Each Raga has specific rules on the types of Gamakas that might be applied to specific notes, and the types that may not. Every Raga has, therefore, to be necessarily rendered with the appropriate Gamakas. They depend on the manner of quivering, oscillations or shaking that the Svaras can be endowed with. 14.3. Gamaka-rendering is a highly individualistic and a specialized skill. Not merely that the Gamakas are designed specifically for vocal music and for instrumental music, but also that each performer would, in due course, develop her/his own Gamaka-improvisations. And therefore, two ragas with identical ascending (Aroha) and descending (Avaroha) Svaras and born out of the same parent (Janaka) Raga might sound totally different in character and expression , mainly because of the Gamakas that are employed. One could say that Karnataka Sangita is Gamaka oriented. And, it is, perhaps, because of such extensive use of Gamakas, it has not been easy to commit Karnataka Sangita to notation system. Gamakas can be taught and practiced only by oral method, through Guru-Shishya interactions. Apart for the above mentioned, there are certain other Angas (limbs) that are essential to the song formats in Karnataka Sangita. These are: Pallavi, Anu-pallavi, Chjttaswaram, Mukthayiswaram and Charanam . The Pallavi is a sort of introduction to the piece; and, it must establish the Raga, Taala and bhava of the entire song. The Pallavi is rendered usually, in the middle octave (madhyama sthayi), though Sangathis take it to the higher and lower octaves at times. Pallavi is the counterpart of Udgraha of the Prabandha compositions. The Anu-pallavi links the Pallavi to the Charanam. It is analogous to Melapaka of the Prabandha. The Anu-pallavi is usually sung in the higher octave. The Charanam provides the climax of the Sahitya aspect of the song. Neraval and Kalpanaswara often resolve in the Charanam, though this is not a rule. The Charanam has a range from the lower to the middle to the higher octaves, thus having the widest range of the angas of a song. 16.1. For Indian Music, Sruthi and Laya are said to be the parents of music: ‘Shruthi Matha Laya Pitha ’ . The term Laya (to be one with) denotes Taala (rhythm). Sarangadeva remaked that music, vocal , instrumental, and dance are based on units of time-measure, or Taala: ‘gitam vaadyam thathaa nrtyam yatasthale pratishthitham.’ Bharatha said that without a sense of Taala, one could neither be called a singer or a drummer. Earler to that , Bharatha had further elaborated on Taala in the 29th chapter of the Natyashastra, saying that it is a definite measure of time upon which Gana, or song, rests: ‘ganam talena dharyathe’. 16.2. While Raga dictates the appearance and characteristics of a melody, it is the Taala that sets the rhythm and beat of any piece in Indian music. All Taalas of Karnataka Sangita are cyclical in nature, i.e. a single unit is taken and repeated to form the Taala pattern or rhythm. There are different units of Taala. An important unit, one of the smallest, is the akshara (lit. Alphabet) . The akshara is not defined in terms of absolute duration ; but it is conceived as a variable that changes according to the mood of the composer, the piece and the performer involved. The akshara is further divided into Svaras. And, the Svaras are of five different measures – Tisra (3), Chatusra (4), Misra (7),Khanda (5) and Sankeerna (9). The smallest measure of Svaras is Tisra. Strangely enough, two is not taken as the smallest number, perhaps because two is too small a number to stand on its own as a beat. The number divisible by 2 that is used instead is four, in Chatusra. These Svara divisions are made easier to remember with the help of the meaningless syllables used primarily in dance or percussion training. For Tisra, the syllables ‘Tha Kita’ are used. Chatusra is denoted by the syllables ‘Thakadhimi’; Khanda – ‘Thaka Thakita’; Misra -‘Thakita Thakadhimi’;and , Sankeerna – ‘Thakadhimi Thaka Thakita’. 16.3. The means and materials of Taala according to Bharatha in his Natyashastra are ‘laya, yati and pani’. The Laya, or tempo, is divided into fast, medium and slow speeds, i.e. Druta, Madhya and Vilambita. And, Yati is a kind of method of application of laya. It is of many kinds; the three of which are sama, srotogata and gopuccha. The sama-yati possesses three units of tempo: one in the beginning, one in the middle and one in the end. The srotogata contains three units of tempo, as well: the first is slow (vilambita), the second is medium (Madhya) and the third is fast (druta). The gopuccha-yati consists of three units of tempo, where in the beginning of the song the tempo is fast, then it becomes medium and in the end it becomes slow. 16.4. The present day Karnataka Sangita has a Taala System based on the scheme of Sapta Taala (seven Taala). In order to facilitate easy and accurate methods of reckoning these Taalas, the shadangas (six parts) are used. There are symbols to denote these angas. Except for the anga known as ‘laghu,’ the others have fixed time measures. 17.2. Indeed, Raga is basically a feeling, an emotional experience shared by the performer and the listener. The expression of the Raga is essentially through the combination of certain notes and twists of melody. But, Raga is more than its structure. Raga is an icon. It is indeed a living, fluid, organic entity. The raga bhava is visualization of the Raga in a seemingly tangible form that draws the listener into the music. According to Matanga, an ancient authority, : A Raga is called by the learned, as that kind of sound composition (dhwani-bhedaya), which is adorned with musical notes (Svara) , in some peculiarly (visesena) , stationary (sthayi) , or ascending (aroha), or descending, (avaroha) or moving values (varna), which are capable of affecting the mind with peculiar feelings or of colouring ( Ranjyate ) the hearts of men. A Raga is that which delights: Ranjana-jjayate ragau. If the combinations, growing out of the component members or elements (svaras) of a raga-composition, have any significant qualities, or functions, the ensemble of the raga-form must spell and express some particular states of feelings and emotions. Indeed, they are believed to represent particular moods, association, or atmosphere of the human mind, or of nature, and to be able to call up and invoke a distinctive kind of feeling answering to the state of the mind, or its physical environment, for the time being. Ragas have, therefore, the power of producing certain mental effects and each is supposed to have an emotional value, or signification which may be called the ethos of the raga. Ragas may be said to stand for the language of the soul, expressing itself variously, under the stress of sorrow, or the inspiration of joy, under the storm of passion, or the thrills of the expectation, under the throes of love-longing, the pangs of separation, or the joys of union. 17.3. Ragas keep changing shape; their rendering vary from time to time ; and, new ones are born while others are forgotten. They gain full status when they are repeatedly played and heard. Their main features have to be established and tested by experienced performers whose knowledge and interpretation contributes to the very understanding of the raga-bhava. In this context, Indian musicians often speak of a ‘raga grammar’, sets of rules and patterns that determine the selection of intervals and characteristic melodic movements. This practical knowledge is orally transmitted ; it guides the melodic development of every performance; and, it also forms the essential framework for the manifestation of each raga’s personality as developed by the performer. 17.4. Each raga has its own definite personality; and can easily be recognized. A musician may compose in the same Raga many number of times; and, yet it is possible that new tunes can be composed using that Raga. That is to say, though a given Raga has certain melodic phrases, their forms and expressions are truly unlimited. And yet, a Raga can be recognized in the first few notes, because the feelings produced by the musician’s execution of these notes are intensely strong. The effect of Indian music is cumulative rather than dramatic. As the musician develops his discourse in his Raga, it eventually colors the thoughts, elevates and delights the listeners. 18.1. Raga is the central and predominant melodic concept in Indian music. Raison d’être of a classical music performance is projecting the entity of a Raga in its fullest splendor, so as to offer to the listeners an aesthetic experience which only that Raga can generate ( that is, Raga–specific) . 18.2. Raga-bhava-rasa is a continuum. The Raga ambience creates a mood that binds together the performer and the listener. The elaboration of the idyllic tender passages manifests or becomes (Bhava) the emotive world; and, it creates is an experience shared by the creator and the enjoyer (rasika). In that we, somehow, touch the very core of our being. And, that out-of –the world (alaukika) subjective ultimate aesthetic experience (ananda) is not a logical construct. As Abhinavagupta says, it is a wondrous flower; and, its mystery cannot really be unraveled. 19.1. The advent of Raga changed the whole phase of Indian Music. With its coming, the ancient music-terms and concepts such as Jaati, Grama, and Murchana etc no longer are relevant in the Music that is practiced since say, fourteenth century. Since then Raga has taken the centre stage; and, it is the most important concept in music composition, music performances and even in music-listening. 19.2. The proliferation of Ragas led, in the South, to systematic ways of classifying or grouping (Mela) them based on the technical traits of their scales (Svaras). In North India, Ragas are classified according to such characteristics as mood, season, and time of the day or night. Classification of Ragas plays a major role in Indian Music theories. In the next segment of this series let’s take a look at the various forms of Karnataka Sangita. who is the writer of Raga- lakshanam?